Murder by Gaslight: The Great Sheedy Murder Case. 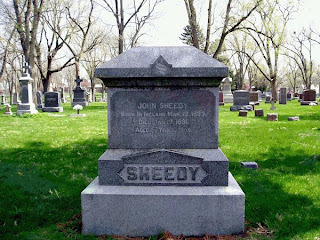 John Sheedy was a real estate developer who owned a gambling casino on the second floor of Gus Sandler’s saloon on the corner of Tenth and P streets in Lincoln Nebraska’s notorious “Uptown district.” Though illegal, the casino had a prominent clientele that included Mayor Carlos C. Burr and other members of Lincoln’s elite. There were two groups interested in closing Sheedy’s casino. The first were competing gambling establishments jealous of his success. Sheedy maintained a virtual monopoly by intimidating competitors and by paying a monthly “rent” to the police to guarantee that his casino would not be raided while others would. The other group fighting Sheedy was a growing faction of reformers angered by Sheedy's open flaunting of the gambling laws. While the casino was still his most profitable enterprise Sheedy was also growing as a real estate developer. In the mid-1880s he erected a three-story commercial building— The Sheedy Building— on P Street. He also built a home for himself and his wife Mary on the corner of P and Twelfth Streets. He had met Mary when he was living at the Arlington Hotel and she was working as a maid there. Mary had come to Lincoln from Illinois with her second husband George Merrill having divorced her first husband, Horace McCool after he was sent to prison. In Lincoln, she and Merrill would frequent the saloons and gambling halls of the Uptown district. 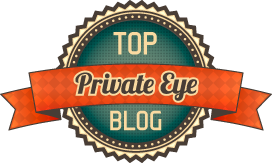 After a fight over Mary's alleged infidelities, Merrill locked her out of their apartment. He sold all the furniture and moved back to Illinois leaving Mary in Lincoln with nothing. While they were separated Mary moved in with John Sheedy and in 1882 she divorced George Merrill. Soon after she moved into the Twelfth Street house, John Sheedy took Mary on a vacation to New Orleans. There Mary gave him an ultimatum; either he marry her or she would stay in New Orleans. They returned to Lincoln as husband and wife and began living a respectable middle-class life. Trouble between them surfaced in 1890 when they took a trip to Buffalo, New York where Mary was treated for a “disease peculiar to women.” They had a fight and John returned to Lincoln, leaving Mary in Buffalo. While alone there she met and fell in love with Andrew “Harry” Walstrom, a machinist and traveling salesman. When Mary returned to Lincoln to reconcile with John Sheedy, Walstrom followed her there. 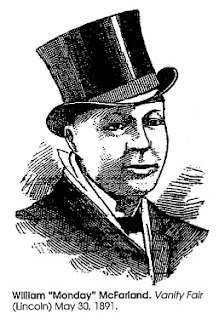 On January 11, 1891, just before eight p.m., John Sheedy left his house heading for the casino. A man sprang from the shadows and struck him on the side of the head with a leather-covered steel cane. Sheedy pulled out a pistol and to shoot the assailant who dropped the cane and disappeared down Twelfth Street. Mary helped John into the house and sent for a doctor and the police. One of the neighbors, also a doctor, came by to help. The two doctors bandaged the head wound and gave Sheedy a pain reliever. They did not think the injury was fatal. Later Mary Sheedy gave her husband some sleeping powder in a cup of coffee. In the middle of the night, Sheedy was stricken with paralysis and fell into a coma. He never regained consciousness and died about ten o’clock the following night. At nine o’clock the next morning, in a jury room overflowing with reporters, policemen, lawyers and politicians an inquest began. The coroner’s jury decided to meet in secret, requesting that all the observers leave. The reporters were furious and began to question the legitimacy of the jury and suspected a cover-up. The inquest concluded that Sheedy had been murdered, death resulting from internal bleeding caused by a blow to the head. Some, including some of the jurymen, doubted that the blows could have caused Sheedy’s death, saying the symptoms more closely resembled morphine poisoning. Police Chief Samuel Melick and Detective James Malone began to search for the killer. Mary Sheedy and some other witnesses said it was a black man they saw running down Twelfth Street. A pawnbroker recognized the cane and remembered selling it to a black man named William “Monday” McFarland. Two days later McFarland was arrested in an Uptown bar. He was taken to city jail and held in a dark airless “sweatbox” between rounds of questioning. McFarland finally agreed to confess when Melick and Malone threatened to turn him over to the angry mob that had gathered outside the jail. McFarland was a barber and hairdresser who had been hired by John Sheedy to do his wife’s hair. During his regular weekly house calls McFarland became friendly with Mary Sheedy. and before long the relationship became sexual. McFarland told the police that Mary had confided to him that her marriage was a sham. 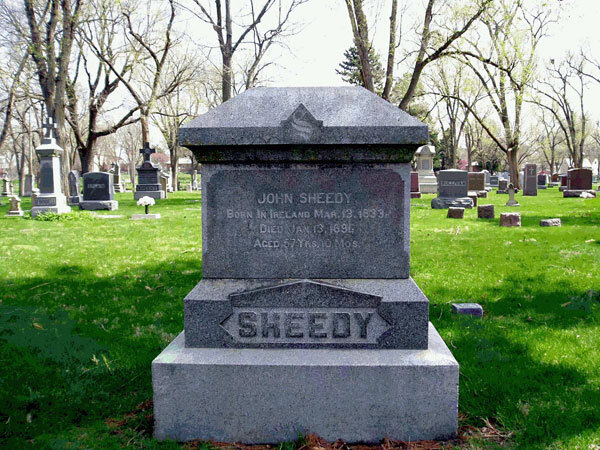 John Sheedy had reverted to being an “all-around sport,” having liaisons with other women. And she told him about her own affair Andrew Walstrom. Eventually, McFarland said, Mary offered to pay him $20,000 to murder her husband. She stood to inherit an estate worth $200,000. When he refused she threatened to tell her husband about her affair with McFarland. He finally agreed. McFarland made two failed attempts to shoot John Sheedy before finally succeeding to club him with his cane. However, McFarland said, it was Mary who actually killed him by putting poison in his coffee. Mary Sheedy and Andrew Walstrom were arrested and charged with murder. Monday McFarland withdrew his confession, claiming it was made under duress; he pled not guilty. Mary Sheedy also pled not guilty. Charges were dropped against Walstrom due to lack of evidence. As was customary at the time, a number of attorneys began independent investigations, hoping to sell their strategy to the defense. Among them, briefly, was future presidential candidate, William Jennings Bryan. In the end, Mary went with her late husband’s long-time attorneys, and McFarland had two court-appointed attorneys who had previously represented him. 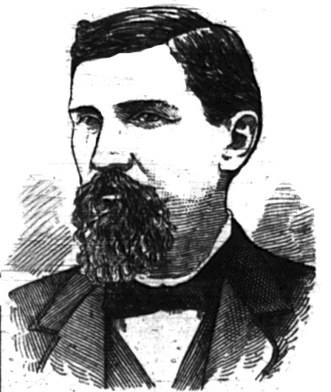 John Sheedy’s brother Dennis, a prominent banker in Denver, Colorado arrived in Lincoln with two Pinkerton detectives and his own team of attorneys to assist the prosecution. Dennis Sheedy aligned himself with John Fitzgerald, a reform politician who had been an adversary of John Sheedy. Fitzgerald was also appointed co-administrator, with Mary Sheedy of John Sheedy’s estate, estimated to be worth $200,000. The situation was confusing enough to raise suspicion of conspiracy, especially since the Nebraska Supreme Court had ruled, just nine days before the murder, that a murderer could not inherit from his victim. The population of Lincoln was bitterly divided. It took a full week and 216 potential jurors to find twelve who had not already formed an opinion. Both sides agreed that Mary Sheedy and Monday McFarland should be tried together. The defense believed that the combined evidence would actually weaken the prosecution's case. The prosecution knew the only way to introduce McFarland’s confession in Mary Sheedy’s trial was to try the two together. After the jury was selected the trial lasted another eighteen days. Beyond the confession, read in court by the prosecution, most of the evidence was circumstantial. John Sheedy’s stomach was analyzed by a chemist who found no trace of poison. Sheedy’s body was disinterred and his liver spine and other organs were also analyzed, also with no sign of poison. The judge instructed the jury before they deliberated, that they could not use the evidence in McFarland’s confession against Mary Sheedy. There was mixed reaction in the courtroom when the jury returned a verdict of not guilty for both defendants. Verdict: Mary Sheedy and William "Monday" McFarland - not guilty. Monday McFarland left Lincoln shortly after the trial. Later in 1892, Mary Sheedy married Max Burst, a salesman for the American Tobacco Company, and moved to San Francisco. 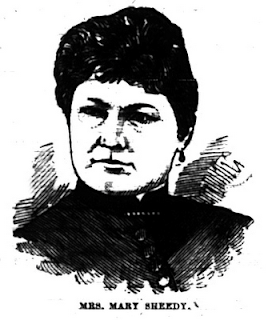 In 1893 Mary Sued her late husband’s estate—now administered by Dennis Sheedy— for a larger monthly allowance. The suit failed. The Great Sheedy Murder Case is the subject of the award-winning web site Gilded Age Plains City, which uses the murder as a starting point to analyze the politics and social attitudes of Lincoln, Nebraska in the 1890s. HIRED HER HUSBAND'S ASSASSIN. ; THE MURDERER OF JOHN SHEEDY IMPLICATES HIS WIFE. He is purported to be buried in Calvary Cemetery, Lincoln, Nebraska.